KIEV, Ukraine -- Ukraine has named 14 Russian singers and actors, including French-born Gerard Depardieu, whose work will be banned from TV, radio and cinemas. 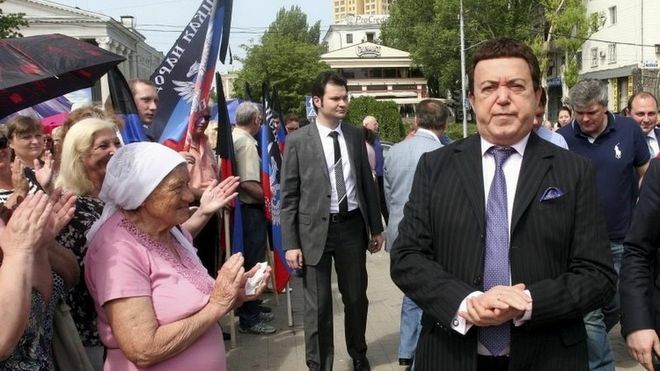 Singer Iosif Kobzon (R) has repeatedly stated his support for pro-Russian separatists in Ukraine's east. Ukraine said they were a "threat to national security" for supporting Russia's annexation of Crimea and pro-Russian separatists in the east. Depardieu, who received a Russian passport in 2013, was last month banned from entering Ukraine for five years. The actor has described Russia as a "great democracy". The blacklist was published by Ukraine's culture ministry (in Ukrainian) on Saturday. The ministry said it acted at the request of Ukraine's security service (SBU). Among those on the list is singer Iosif Kobzon, who was born in Ukraine's eastern Donetsk region, part of which has been seized by the separatists. 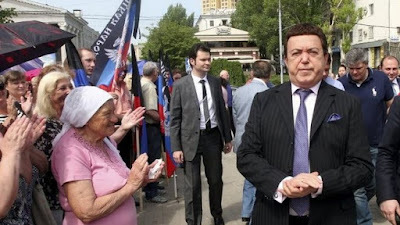 Kobzon has already been targeted by EU sanctions for supporting Russia's actions in Ukraine. Responding to Ukraine's move, some of the actors and singers said they were "honoured" to be on the list. Nearly 7,000 people have died in fighting in Ukraine's Donetsk and Luhansk regions since April 2014. The clashes began a month after Russian President Vladimir Putin annexed Ukraine's southern Crimea peninsula. Ukraine and the West accuse Russian of sending its troops and arming the separatists in Donetsk and Luhansk. Moscow denies the claim, but admits that Russian "volunteers" are fighting alongside the rebels.